Last analysis of Silver expected more upwards movement towards a target at 20.184 before the resumption of the downwards trend for one final fifth wave. Upwards movement continued and has reached 0.305 above the target so far. Minor wave B is an almost complete zigzag, which is within a bigger zigzag trending upwards one degree higher for intermediate wave (B). Because within intermediate wave (B) minor wave A subdivides as a five wave structure, minor wave B may not move beyond the start of minor wave A. This wave count is invalidated with movement below 18.215. Minute wave c is an incomplete impulse. At 18.591 minute wave c would reach equality in length with minute wave a. The narrow channel drawn about minute wave c is drawn using Elliott’s second technique. Draw the first trend line from the ends of minuette waves (ii) to (iv), then place a parallel copy upon the end of minuette wave (iii). I would expect minuette wave (v) to end within this channel. 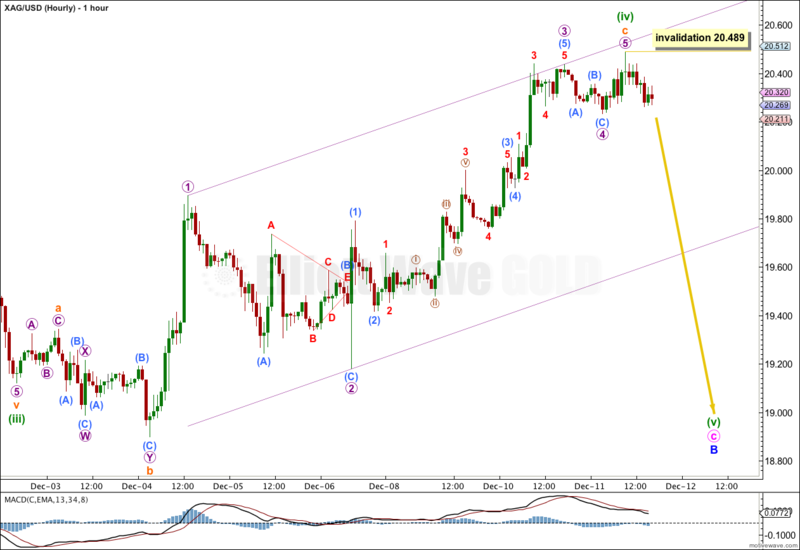 Minuette wave (iv) is outside the price territory of the fourth wave of one lesser degree; subminuette wave iv price territory is from 19.595 to 20.323. Fourth waves most often end within the price territory of the fourth wave of one lesser degree, but not always. At 18.999 minuette wave (v) would reach equality with minuette wave (i). This would see the fifth wave truncated, which is possible after a strong extended third wave. Equality with the first wave is the most common ratio for a fifth wave, so that is what I am using for this target calculation. If minuette wave (iv) moves higher then it may not move into minuette wave (i) price territory. This wave count is invalidated with movement above 21.598. Minuette wave (iv) is now a completed expanded flat. Within it subminuette wave b is a 200% correction of subminuette wave a, and subminuette wave c is 0.06 short of 6.854 the length of subminuette wave a (an unusual Fibonacci ratio, but mathematically correct). This C wave is very long indeed which fits the overall behaviour of expanded flat corrections which have particularly deep B waves. Ratios within subminuette wave c are: micro wave 3 has no Fibonacci ratio to micro wave 1, and micro wave 5 is 0.02 longer than 0.236 the length of micro wave 1. Within minuette wave (v) no second wave correction may move beyond the start of the first wave. This wave count is invalidated with movement above 20.489. If this wave count is invalidated with upwards movement then I would expect that minuette wave (iv) is continuing higher. 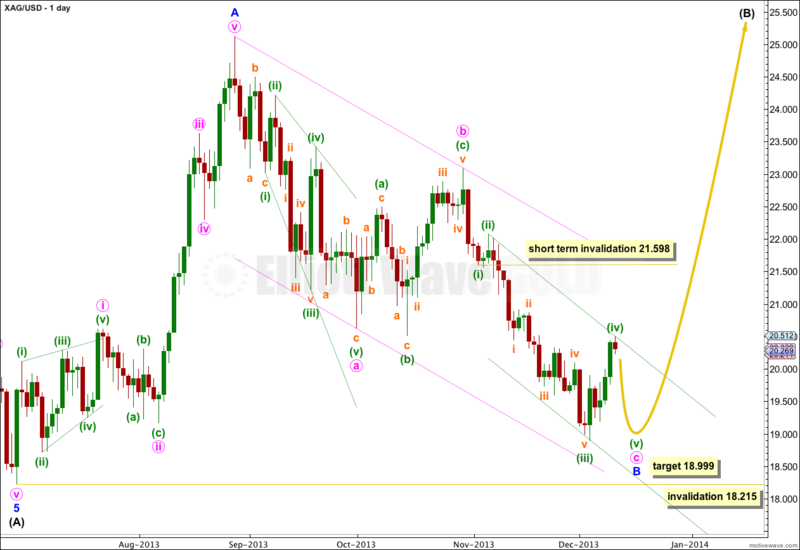 The invalidation point moves up to 21.598. My wave count still expects a final fifth wave down, most likely to make a new low 18.986 to avoid a truncation. I think two day correction is wave 2, tomorrow will form wave 3 to go up, how do you think?